High Temperature Bearing Grease | Heavy Loads & Extreme Pressure | Superior Industries, Inc. 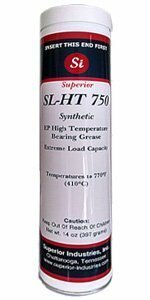 Choose SL-HT 750 for a superior high temperature bearing grease that can easily and dependably sustain extremely high heat, heavy load capacities, and high shear applications. 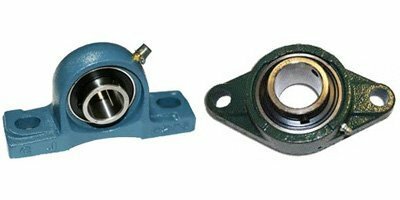 This high temperature bearing grease guards low RPM bearings from the taxing heat and wear found in and around industrial processing plants, automotive assembly lines, paper and textile processing, furnaces, and mines. Protect heavy machinery for the long haul with the high heat endurance of SL-HT 750. SL-HT 750 is built for extreme pressures. Fortified with Molybdenum Disulfide, this high temperature bearing grease provides excellent anti-seize abilities as well as excellent plating for just about any low-speed bearing. When conventional greases cannot withstand the heavy shock loads and high pressure, reach for SL-HT 750 to lubricate critical bearings. Synthetic thickeners ensure that this high temperature and pressure bearing grease stays in place even under harsh industrial or mechanical conditions. This high-quality grease has been a hit in automotive assembly plants, mining applications, construction equipment, and industrial plants such as textile and paper mills. 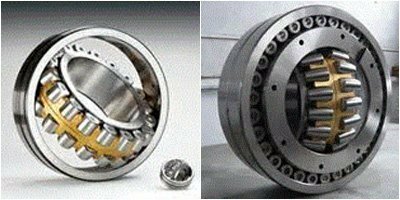 SL-HT 750 is designed for use in low speed bearings. If RPM’s exceed 100, consult our technical team for the appropriate lubricant recommendation. Extreme high heat applications require specific, heat resistant grease formulas to avoid melting out, ineffective viscosity, and carbonization. SL-HT 750 is guaranteed to withstand sustained high temperatures up to 1090° F (604° C) while still supporting heavy shock loads at temperatures as low as -25° F (-35° C), making it an incredibly versatile load bearing grease. The secret to its success is found in our pure, highest-quality Molybdenum additive which prevents baking out and other hazards of clay-based thickeners at high temperatures. This high temperature bearing grease also contains highly refined, synthetically fortified fluids compounded with metallic sub-micron particles in a colloidal suspension. Superior Industries forms these highest-quality fortified fluids into solid grease with the finest synthetic additives for a bearing grease that leads the field in effectiveness, durability, and quality. SL-HT 750 effectively eliminates the chance of carbonization—a major contributor to excessive and premature wear—and keeps bearing failure down to a minimum. The combination of Molybdenum and other additives with the synthetic grease base creates a top-of-the-line grease that maintains long life despite extreme heat. Depend on SL-HT 750 to decrease friction, noise, chatter and wear on bearings and other moving parts as well as extending the life of valuable mechanical equipment. This high temperature bearing grease is multi-functional, long-lasting, and recommended for almost any type of oven, foundry, or other high temperature application. SL-HT 750 successfully lubricates bearings critical to tenter frames, lithographed or enameled metal baking ovens, steel mill roll-out tables, industrial fans, water pumps, furnace trolleys, kiln trucks, automotive assembly conveyors, and drying ovens. This synthetic bearing grease has been proven to achieve outstanding results lubricating bearings at high temperatures under harsh shock and shear conditions. Not only does this high temperature bearing grease prove its stability to shear and heat, it also displays excellent resistance to water, moisture, and thus corrosion. SL-HT 750's ability to guard metal from humidity, steam, and water staves off rust and corrosion to keep bearings and machinery in great working order. SL-HT 750 remains highly effective even when exposed to acidic or salt spray conditions. These harsh environments have little or no effect on this top-quality bearing grease, making SL-HT 750 the lubricant of choice for heavily loaded bearings in extreme conditions such as marine environments, processing plants, and outdoor construction sites. Superior’s high temperature bearing grease continues to support trolleys, conveyors, motors, and roll-out tables despite the presence of steam, salt spray, and corrosive chemicals. 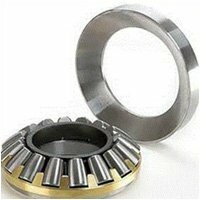 In a nutshell, SL-HT 750 is specifically compounded to provide excellent lubrication and wear protection for low-speed bearings under heavy loads with excellent resistance to sustained extreme high temperatures.